Gregoire is a regional distributor of BMW cars in Bornem, Belgium. 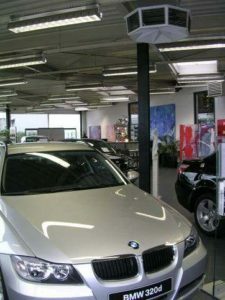 Typical of many car showrooms it is a building constructed with predominantly glazed walls. Whilst the glazing is excellent for displaying cars it does lead to very high levels of solar heat, resulting in temperatures reaching in excess of 35C. Not only does this make for an uncomfortable working environment, but the excess heat can have an effect on the new cars. An effective cooling solution was required to cool the showroom, this would need to be a cost-effective, efficient and preferably environmentally friendly solution. Evaporative cooling was chosen to cool the showroom because of its simplicity, low cost and environmental advantages over refrigeration based air conditioning. A standard EcoCooling EcoCooler can save businesses and organization up to 90% of their cooling costs when compared to traditional refrigeration. In addition, evaporative cooling has the ability to reduce the carbon footprint and transform cooling into a ‘green’ solution which provides natural air and reduces the amount of harmful refrigerants in the environment. For this particular case study, the roof of the showroom is single skin corrugated metal with a layer of insulation and a felt final external covering. A down discharge EcoCooling EcoCooler was fitted to the roof using an up-stand, which was supported by additional steelwork fitted to the metal and felt layer and weatherproofed to the up-stand. The cooler then feeds into an eight-way plenum achieving approximately 12 air changes per hour for the showroom. The air is able to be evenly distributed throughout the showroom and target specific areas to enable spot cooling as well as a general flow throughout the building. The EcoCooler has the ability to run in two different modes; Ventilation mode and cooling mode. The outside ambient air temperature will determine the mode the EcoCooler will run in. Evaporative cooling’s ability to cool large spaces with efficiency has led to Gregoire returning to EcoCooling for installations in two new servicing workshops within their estate. These are under construction and demonstrate the flexibility of our equipment to fulfil the specification of both new builds and retrofit. Regional installers Borcalor are fitting out the system to keep lead times as short as possible.